Spirit bears are rare. They are only found in British Columbia. 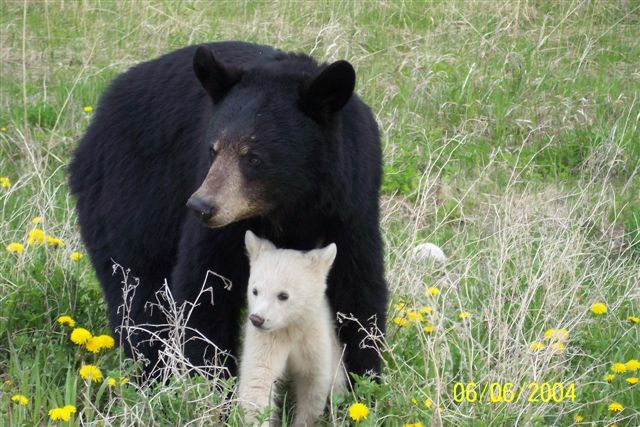 In all of British Columbia, only about 1 in 100 black bears has white fur. 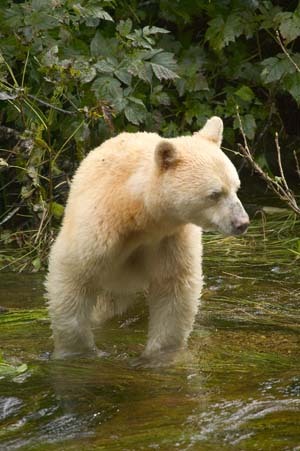 Most spirit bears live in the Great Bear Rainforest. This rainforest is on the coast of British Columbia. On some of the islands in the Great Bear Rainforest as many as 1 in 3 black bears has white fur. Spirit bears, like other black bears, eat plants such as berries, nuts, and fruits. They also eat small animals such as baby deer and baby moose. Most of all, they love salmon. Spirit bears have an easier time than black bears at catching salmon. Their white fur makes them harder for the salmon to see. After getting nice and fat over the spring, summer, and fall, the bears sleep in their dens all winter. During the winter, spirit bears can go without food for up to seven months. Spirit bears mostly live alone. They mate in the summer but do not stay with their partner. The mother gives birth in January or February. By the time the cubs are a year and a half old, they are ready to go out on their own. 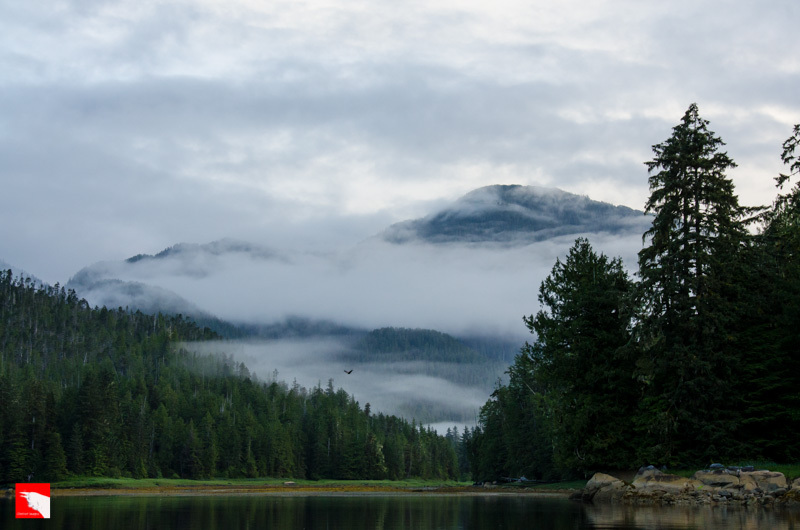 The Great Bear Rainforest is the traditional land of 12 different First Nations. These First Nations groups have never hunted the spirit bear. It is now against the law for anyone in British Columbia to hunt a spirit bear. Without the threat of people or any other animals, spirit bears can live to over 25 years old. Yet many people say the spirit bear is at risk. 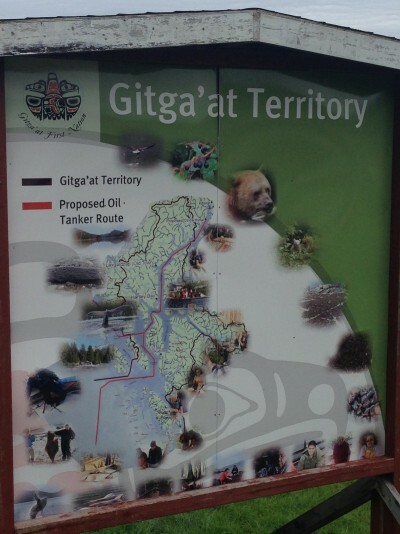 A company called Enbridge would like to put a pipeline through the Great Bear Rainforest. The pipeline would carry oil. The oil would then be shipped across the sea to Asia on oil tankers. Some people are worried about oil spills. A big oil spill in the Great Bear Rainforest would destroy the place where most of the spirit bears on earth live. A big oil spill would kill many plants, fish, and animals that the spirit bear eats. Oil spills are difficult to clean up. Enbridge says the spirit bears are not at risk. They say pipelines and oil tankers are very safe. They also say that the pipelines will help people in lots of ways. Building pipelines will create jobs for local people. Enbridge will pay taxes to the government, which can be used for schools and hospitals. Is the spirit bear at risk? What do you think should become of the home of the spirit bear? The letter y can make lots of different sounds, depending on where it shows up in a syllable. A one syllable word that ends in y usually makes a long /i/ sound, like in cry and this word from the story: by. If the word has more than one syllable and ends in a y, the y usually makes a long /e/ sound, like in baby. The story has these words, too. See The Rare Spirit Bear in BC Reads: Adult Literacy Fundamental English – Course Pack 3. Kermode bear/Spirit bear by Haplochromis is used under a CC BY SA 3.0 license. Great Bear Rainforest by Jim Maloney is used under a CC BY NC ND 2.0 license. Kermode bear near Lava Lake by miguelphotobooth is used under a CC BY 2.0 license. Can you see the resemblence? by beingmyself is used under a CC BY-ND 2.0 license. Sign at Hartley Bay by Meghan Coughlin is used under a CC BY-ND 2.0 license. 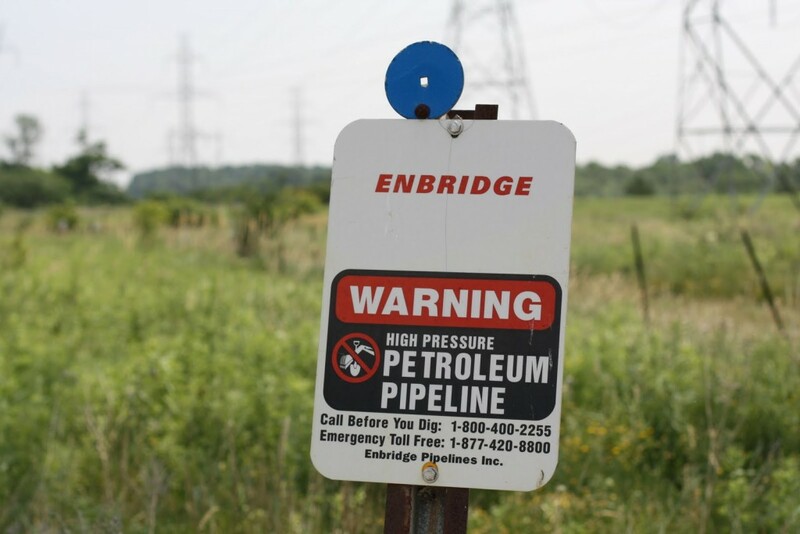 Enbridge pipeine marker by Environmental Defence Canada is used under a CC BY NC 2.0 license. The Rare Spirit Bear by Shantel Ivits is licensed under a Creative Commons Attribution 4.0 International License, except where otherwise noted.